The Canadian Rockies have legendary light airy snow and there’s no shortage of places to enjoy it. You’re actually spoiled for choice when it comes to Alberta ski resorts. Whether you’re a novice skier, a mogul maven or a backcountry buff, you’ll find plenty to love – both on the slopes and off. Here are seven amazing Alberta ski resorts to put on your hit list this season. With an annual snowfall of up to 9 metres (30 feet), it’s safe to say that Banff Sunshine Village gets more snow than most other Alberta ski resorts. The resort is also home to Sunshine Mountain Lodge, the only ski-in, ski-out hotel in Banff National Park. Sunshine Village has 3,358 acres of skiable terrain and a top elevation of 1,660 m (5,450 ft). There are 120 named runs on three mountain faces and the resort stretches between the Canadian provinces of Alberta and British Columbia. There are plenty of lifts including a gondola and a high speed quad chair with heated seats and bubbles. For après-ski fun, there’s a good restaurant and lounge at the slope-side lodge and several other restaurants in Sunshine Village. You can also head into the mountain town of Banff where you’ll find a distillery, bars, lounges and some great restaurants and shops. The signature snowshoeing experience is a great winter activity. In summer, you can hike to the Sunshine Meadows and enjoy the wildflowers. One of the largest ski resorts in North America, Lake Louise Ski Resort has 4,200 acres of skiable terrain over two mountains. The longest run is 8 km (5 mi) long. This Alberta ski resort is fantastic for families or groups who have skiers and boarders of varying abilities. You can access beginner, intermediate and expert runs from every chairlift. There are 145 marked runs plus back bowls, ten lifts including one gondola and 5 chairlifts. The resort has a tube park, a terrain park and a fantastic beginner’s area. The top elevation is 2637m (8650 ft). There are several restaurants, cafeterias and lounges onsite for après-ski fun. First Tracks Ski & Snowboard Lessons is a unique ski experience that lets you access the mountain before it opens to the general public. The Lake Louise Gondola is used in the summer for sightseeing and grizzly bear viewing. Mt. Norquay is the closest ski resort to the picturesque town of Banff. It has 60 named runs spread over 190 acres of skiable terrain. This resort has some history with locals. The first ski lodge opened on Mt. Norquay in 1929 and the first motorized ski lifts were installed in 1942. The resort has 5 chairlifts, a terrain park, a tubing park and offers night skiing. In the summer, you can climb the via ferrata to the top of the mountain. There are several restaurants and lounges on the mountain including the exceptionally good Cliffhouse Bistro. Note: You can purchase a tri-area lift ticket that lets you ski three Alberta ski resorts on a single ticket – Sunshine, Lake Louise or Mt. Norquay. 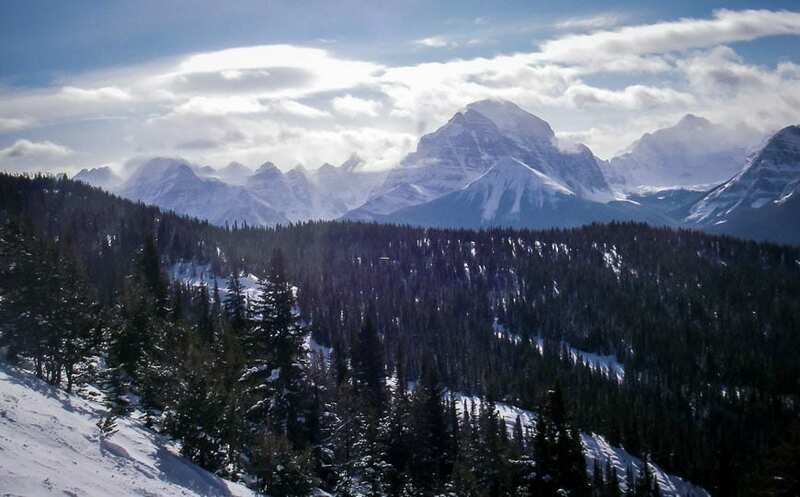 Built for the 1988 Winter Olympics, Nakiska Ski Area is only about an hour outside Calgary in Kananaskis Country. “Nakiska” is a Cree word that means “meeting place.” The resort itself is set on the east face of Mount Allan and has 64 named runs spread over 1021 acres. The resort is used for early season training by several alpine teams. There’s a terrain park and a tube park onsite and the resort offers guided snowshoe excursions. There are several options for on-mountain dining or you can head to one of the great restaurants or bars at the nearby Pomeroy Kananaskis Mountain Lodge. Just outside the town of Jasper, Marmot Basin has 91 named runs on four mountain faces covering 1720 acres. Marmot has 3,000 feet of vertical drop and the highest base elevation of all ski areas in Canada. The seven lifts can transport 12,000 skiers per hour, but the hill is never that busy. In 2017, the resort opened “Tres Hombres,” an incredible 45-acre area with advanced and expert off-piste skiing and snowboarding terrain. There’s also a good selection of beginner and intermediate runs to enjoy at this Alberta ski resort. There are three on-mountain day lodges and even more restaurants and lounges in the town of Jasper. There are also a wide range of activities for adventurous travelers to enjoy in Jasper in winter. Located in southwest Alberta just outside the town of Pincher Creek, Castle Mountain Resort is the hidden gem of Alberta ski resorts. The resort has 3,000 vertical feet and some of the longest runs in North America. It also gets a phenomenal amount of snow – 9 metres (30 ft) on average annually. There are 94 trails, 7 lifts and two terrain parks on two mountain faces. The resort also has one of North America’s only resort-based cat ski operations, the Powder Stagecoach. In winter, non-skiers can enjoy a tour on the powder stagecoach or enjoy a guided snowshoe adventure. The biggest event in summer is the annual Huckleberry Festival. In preparation for the 2019 Canada Winter Games, Alberta’s largest non-mountain ski resort underwent a $1.6 million renovation. Canyon Ski Resort improved its terrain, widened ski runs, upgraded snowmaking equipment and updated the onsite ski chalet. The resort is now home to Western Canada’s best mogul site. There are 18 runs over 70 acres of skiable terrain. The resort has 6 lifts, a snow tube park, a terrain park and a lodge with a cafeteria and a lounge. Canyon is just outside Red Deer, Alberta’s third largest city. This guest post was kindly written by Debbie Olsen, an award-winning writer and photographer and co-author of the national bestselling book, “125 Nature Hot Spots in Alberta.” Check out her blog –wanderwoman.ca.